The Henry Miller Library Went to Paris – May 5-11, 2014! Update! (5.11.14) Check out House of Nod’s teaser for “Henry Miller’s Paris,” containing footage shot across the past week HERE!! And less than a day remains to make a tax-deductible contribution to this worthwhile cause – and amazing prizes are still available! Click HERE, and Merci!! 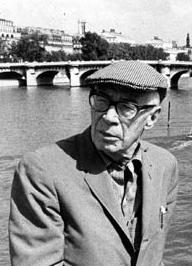 In 1930 Henry Miller returned to Europe with ten dollars loaned to him by friend Emil Schnellock. He intended to go to Spain but ultimately landed in Paris. He remained there for close to 10 years. By 1932, he met Anais Nin in Louveciennes and wrote writing “Tropic of Cancer” while walking the streets and sleeping where possible. Two years later, at the age of 34, Miller moved to #18 Villa Seurat on the same day that “Tropic of Cancer” was published. Miller lived and wrote in Paris for the rest of the decade finally returning to the US in 1940. In this seventh-floor walk-up Henry Miller came close to starving during his first winter in Paris (1930). The apartment belonged to Richard Osborn, an American lawyer, who gave Miller a free room. Each morning Osborn left ten francs on the kitchen table in exchange for Miller’s writing for the day. One evening Miller wrote a review of Luis Buñuel’s film L’Age d’or, which Osborn passed on to Anaïs Nin. It was this connection that led to a long relationship between Miller and Nin. In April and May of 1928, Miller and his wife June stayed at the former Hôtel de Paris. June wanted to participate in a bicycle tour throughout the south of France, so Henry taught her how to ride a bike on Rue Visconti in preparation. Miller and his wife stayed here briefly in 1930. Miller wrote a description of Furstenberg Square that appeared in the third chapter of Tropic of Cancer. Miller and his wife June lived here at the then-Hôtel des Etas-Unis, in the fall of 1930. Henry Miller was one of a long list of well known guests at James Jones’ (the author of From Here to Eternity, 1951) three-story house. Hôtel Alba. Henry Miller lived in the Alba during the winter of 1930; having no money, he offered English lessons. However, with no students, he was forced to stay in the office of the cinema manager in nearby Vanves. Home of American writer and edito, William Aspenwall Bradley, who advised Miller to see Jack Kahane, the founder of Obelisk Press. The Obelisk Press published Miller’s early books almost exclusively in the years following. Villa Seurat is a private cul-de-sac about 100 yards long that joins Rue de la Tombe-Issoire on the east side of the street near number 100. Michael Fraenkel, who allowed Miller to live here rent-free for a few months, owned house number 18. For Miller, Villa Seurat symbolized the richness of Paris. In gratitude for the accommodations, Miller cast Fraenkel as the character of Boris in Tropic of Cancer. In July 1939, Miller left Villa Seurat to visit a friend in Greece. With the coming of the war, Miller then returned to America and later wrote that his happiest moments in Paris were those in the Villa Seurat. The Obelisk Press. Englishman Jack Kahane accepted Tropic of Cancer in October 1932 and published it in September 1943. Other Miller books included Black Spring (1939), Max and the White Phagocytes (Seurat Series), and the Tropic of Capricorn (1939).